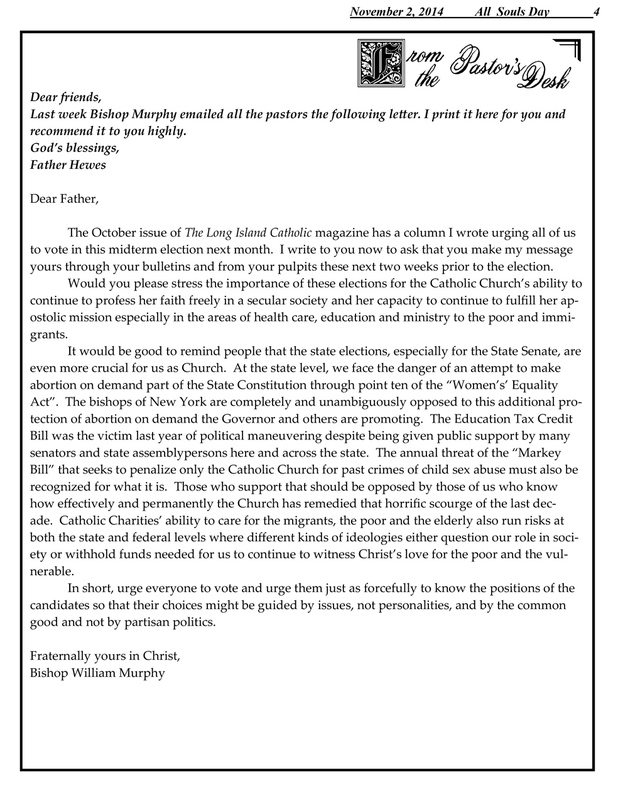 Murphy’s letter , which was sent to all pastors in the diocese of Rockville Centre last week and reprinted in many parish bulletins over the weekend, was intended to advise Catholics on today’s elections. Even though the bill is not on the ballot, Murphy used the letter as an opportunity to condemn proposed law (a condemnation he has offered regularly since 2009 ). The Child Victims Act (which is also known as the “Markey Bill” because it is sponsored by State Assemblyperson Margaret Markey) would serve to protect children by removing the statute of limitations for crimes of sexual abuse of children and minors. It would also open a one-year period for victims previously shut out by New York’s outdated statutes of limitations to bring forth charges in civil court. Those who support [the bill] should be opposed by those of us who know how effectively and permanently the Church has remedied that horrific scourge of the last decade. The Markey bill does not cover only Catholic institutions. In fact, it covers ALL private institutions — prep schools, sports clubs, youth clubs, private daycare and early childhood centers, churches of all denominations, synagogues, mosques, AND, very importantly, sexual abuse crimes committed against children in a home setting. In addition, the Markey bill would open a door for judges to have more flexibility in dealing with sexual abuse crimes committed on public facilities. The bill is NOT targeting Catholic institutions; there is no mention of Catholic in the bill.